Salvador Dali's body is buried in the elaborate museum of his work Dali designed himself in the northeastern Spanish town of Figueres, where he was born over 110 years ago. Figueres, Spain: Salvador Dali's remains are to be exhumed on Thursday from his Spanish hometown in an effort to test a fortune teller's claims the renowned surrealist is her father. The artist's body is buried in the elaborate museum of his work Dali designed himself in the northeastern Spanish town of Figueres, where he was born over 110 years ago. Pilar Abel, a 61 year old who long worked as a psychic in Catalonia, says her mother had a relationship with the artist when she worked in Port Lligat, a tiny fishing hamlet where the painter lived for years. If Abel is confirmed as the only child of Dali, she could be entitled to part of the huge fortune and heritage of one of the most celebrated and prolific painters of the 20th century. 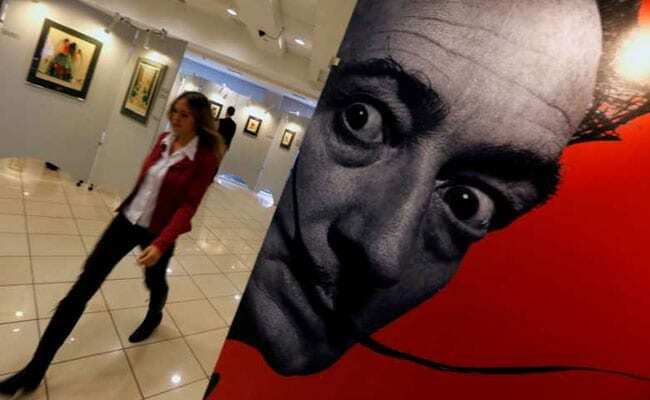 The Salvador Dali Foundation had tried to fight off the exhumation with an appeal, but there was not enough time for all parties to present their case, a court spokesman told AFP. Barring some "administrative or logistical surprise", the exhumation will go ahead, he said. Authorities will begin removing the over one tonne slab covering the tomb of the eccentric artist, who died in 1989 with no known child heirs, after visitors have cleared out for the day from the Dali Theatre-Museum. Experts will take DNA samples in the form of bone or tooth fragments directly from the grave where Dali was buried and they will then be sent to Madrid to undergo the necessary tests. Abel has already provided a saliva sample for comparison, with results expected within a matter of weeks, said the woman's lawyer Enrique Blanquez. The museum, a major tourist site that drew over 1.1 million visitors last year, will be covered in some places with cloth to prevent drones from capturing images of the exhumation. In an interview with AFP last month, just days after a court ordered the exhumation, Abel said her grandmother first told her she was Dali's daughter when she was seven or eight years old, and her mother admitted it much later. Abel is from the city of Figueres, like Dali, and she said she would often see him in the streets. Notoriously eccentric, Dali's life was marked as much by the genius of his work as by his own extravagances. But according to Blanquez, his affair was "known in the village, there are people who have testified before a notary". Born on May 11, 1904 in Figueres to a bourgeois family Dali's father was a legal clerk he developed an interest in painting from an early age. In 1922 he began studying at the Fine Arts Academy in Madrid, where, despite being expelled twice, he developed his first avant-garde artistic ideas in association with poet Federico Garcia Lorca and the filmmaker Luis Bunuel. It was love at first sight between Dali and the woman to whom he gave the pet name Gala. She became his muse and remained at his side for the rest of her life and died in 1982. The couple never had children.